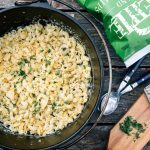 Quick, easy, and super cheesy, this Dutch Oven Mac & Cheese is a great way to make this comfort food classic when camping. 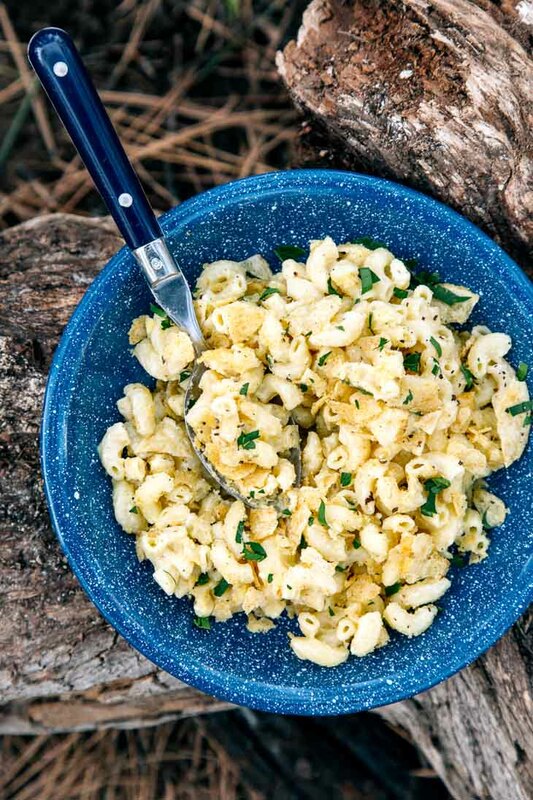 Loaded with creamy, buttery, cheesy goodness, mac & cheese can really hit the spot when we’re out camping. Especially when the evening air begins to cool, there’s nothing more satisfying than tucking into a bowl of heart-warming, stomach-filling Mac & Cheese. It’s our happy place. 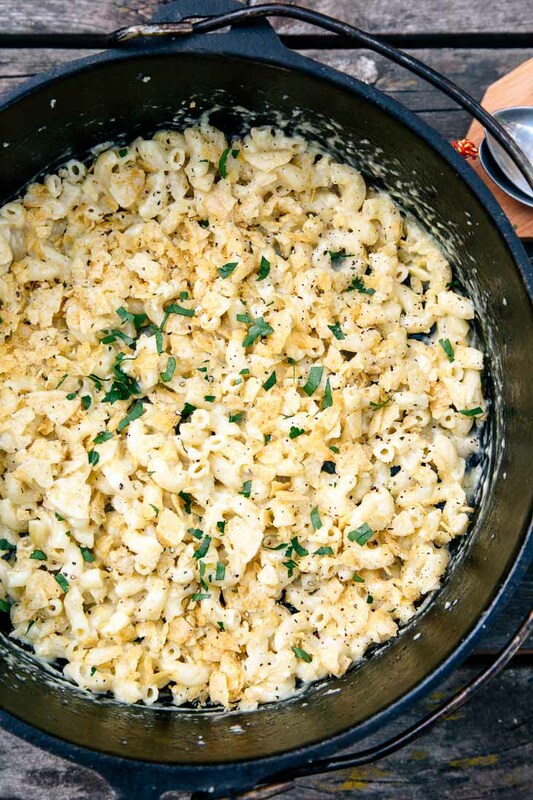 Chances are you’ve made mac & cheese at home before. It’s a pretty straightforward procedure: boil water, add pasta, impatiently hover over it, strain, etc etc. The key benefit of using a Dutch oven is being able to apply heat from the bottom and the top. This radiant heat allows you to steam the pasta instead of boiling it, thus cutting down on the amount of water you need to use. Steaming the pasta also eliminates the need to strain it at the end. And finally, using a Dutch oven allows you to make A LOT of mac & cheese at once without a lot of hassle, making it a great option if you’re cooking for a family or a group of friends. Just set it up, place some coals on it, and let it do its thing. 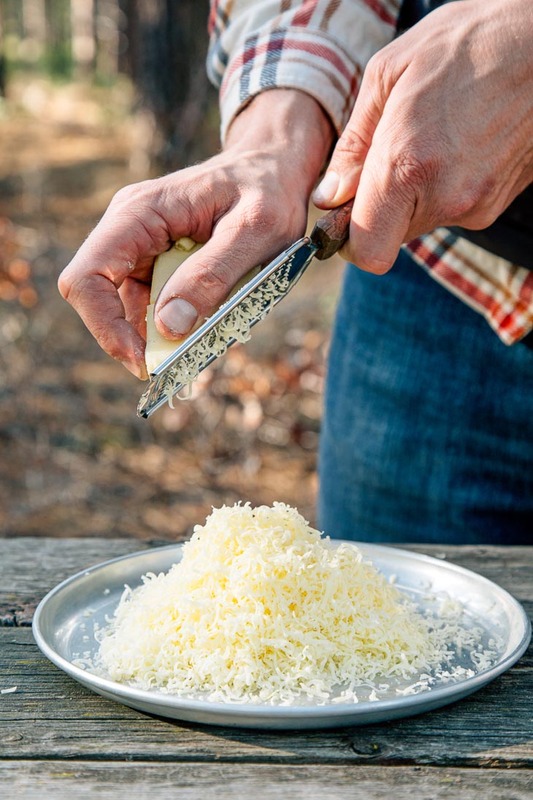 While you can use any cheese you like (we used an aged white cheddar), we do recommend grating it yourself if possible. Pre-shredded cheeses are covered in an anti-caking coating, which we’d prefer to avoid altogether (and it will impede the cheese’s ability to melt into a creamy sauce). And our golden rule is you want a 2:1 cheese to pasta ratio. If you’re putting 1 cup of pasta in, then it needs 2 cups of freshly grated cheese. A few other key additions: garlic powder and a little bit of mustard. There is something about this flavor combination that really amplifies the flavor of the mac & cheese and gives it an appealing golden color. But what really takes this Mac & Cheese to the next level is the crumbled potato chip topping! Not only does it add a little textured crunch, they also allow you to introduce a new set of flavors to the party. We developed this recipe in partnership with Kettle Brand, which is a great, because we’ve been obsessed with their chips for years now. 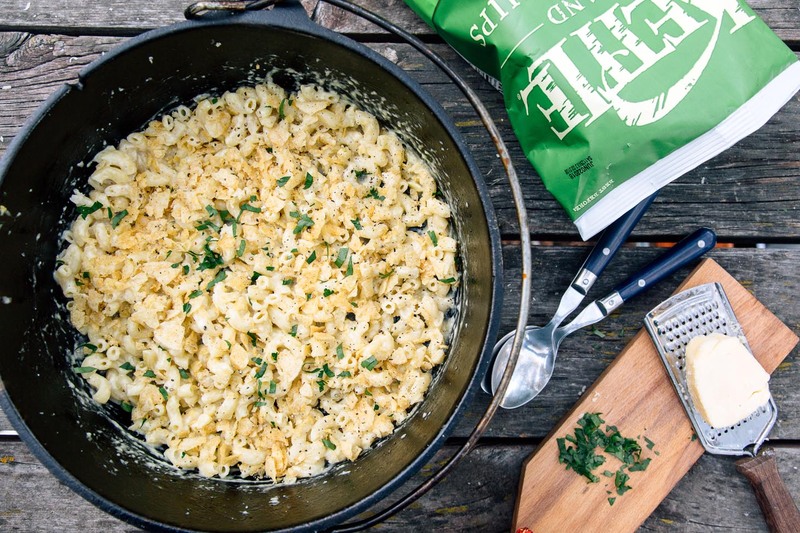 For this Dutch oven mac & cheese, we opted for their spicy jalapeño flavor, which gave the whole meal a great kick. But they’ve got a ton of flavors to choose from, so you can customize your own! 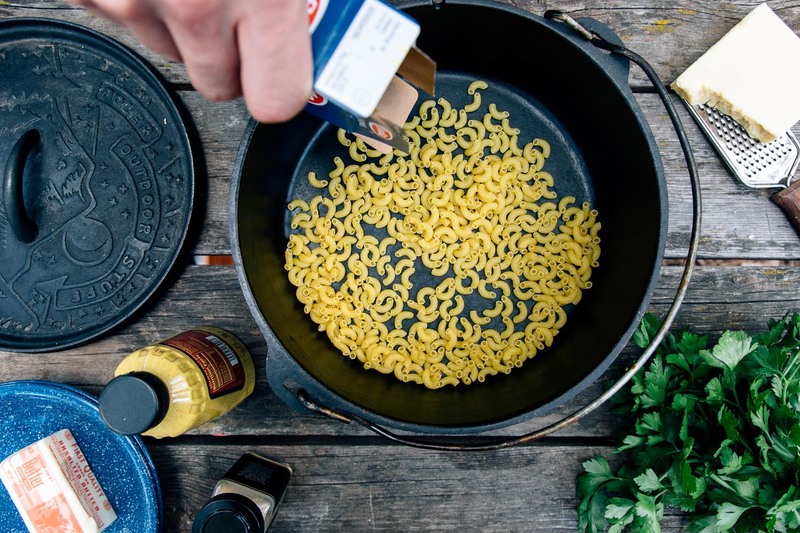 So if you’re in the mood for something cheesy and delicious on your next camping trip, give this Dutch Oven Mac & Cheese a try. And if you want some crunch while you munch, pick up a bag of Kettle Brand Chips. Prepare your coals or campfire. Add the elbow macaroni, water, butter, and salt to a 4-qt Dutch oven. Cover and place on top of a small bed of coals or embers. Place 10-15 coals on top of the Dutch oven. Cook for about 10 minutes, until the pasta is tender and most (but not all) of the liquid has been absorbed. 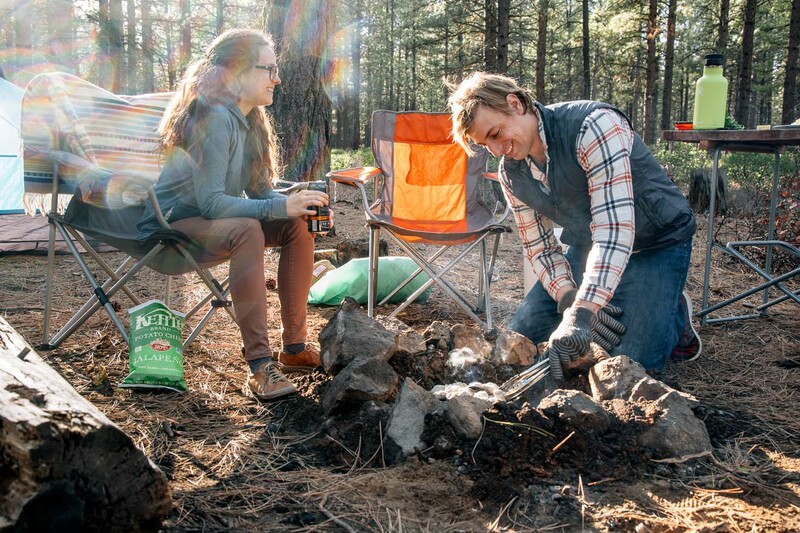 Carefully remove the Dutch oven from the campfire and set aside the lid. Stir in the shredded cheese, mustard, and garlic powder and add more salt if needed. Serve in bowls or on a plate, and top with crushed jalapeño Kettle Brand chips. Enjoy! This recipe can easily be scaled up to feed a crowd! Simply double (or triple!) the ingredients – the method will remain the same. If tripling or beyond, you may want to upgrade to a 12″ Dutch oven. Likewise, this recipe can be halved to serve two. 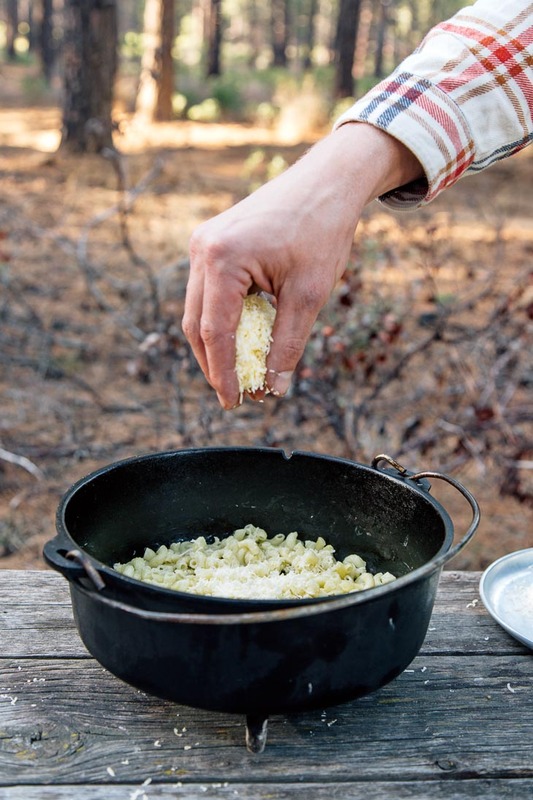 looks very tasty… would try same process..
I’d love to start cooking on a campfire instead of always using my camp stove but whenever I’ve tried, the outside of the pot ends up filthy black, and even after washing it gets the rest of my gear dirty. How do you deal with this? We struggle with this too, especially on our cast irons. We’ve heard all sorts of alleged remedies, but haven’t found anything that actually worked. We will keep exploring options though! But for now, the solution we have (not ideal by any means) we just have a dedicated campfire cast iron that we keep in a plastic grocery bag for storage. Lodge makes some super affordable skillets and we’ve found it to just be easier to have a dedicated campfire skillet. Could you please do a follow up post to this with a vegan Dutch oven Mac n cheese recipie? I’m dying to upgrade mine, and I love your content!! I also highly recommend the dill chip flavor as a Mac n cheese topper. It’s unbelievably good! We should! 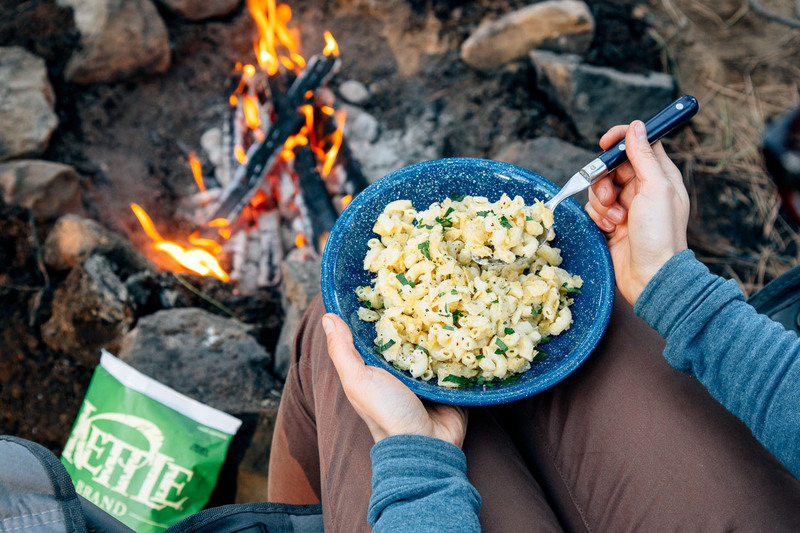 A long time ago we did a vegan mac and cheese for backpacking https://www.freshoffthegrid.com/vegetarian-weekend-backpacking-menu/ and it was pretty good. Shouldn’t be too hard to adapt for a Dutch oven! The chips definitely take this thing to whole new level.